Tearing your hair out because virtualization won’t work on your new Ryzen & Gigabyte K7 PC? 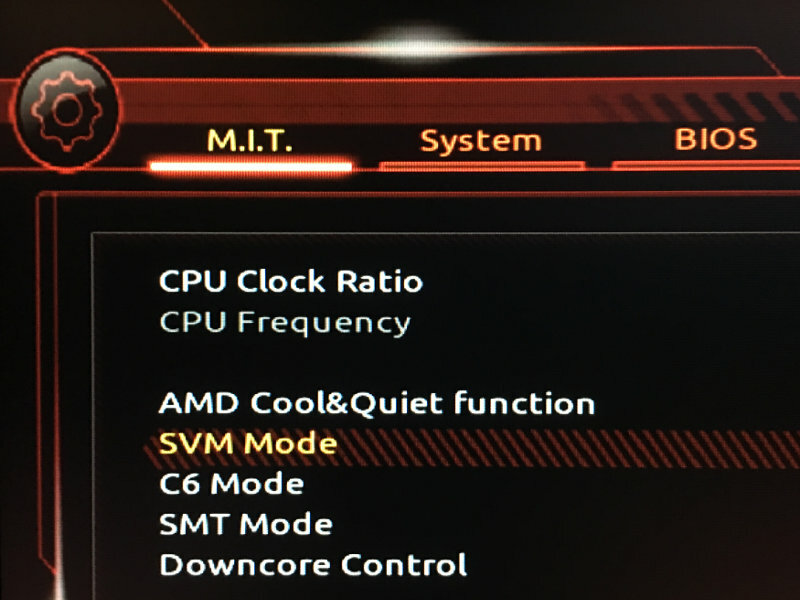 Make sure SVM mode is enabled in your Gigabyte motherboard’s bios, it’s buried in an unexpected spot. You can find it under: “M.I.T” > “Advanced Frequency Settings” > “Advanced CPU Core Settings” > “SVM Mode”. Even when SVM mode is disabled the following will return expected results. However, when you run Virtual Machine Manager you’ll get “KVM is not available.” If you attempt to add the kvm_amd module with sudo modprobe kvm_amd you’ll get "ERROR: could not insert 'kvm_amd': Operation not supported". This lsmod | grep kvm will list kvm but not kvm_amd and VirtualBox will complain that “AMD-V is disabled in the BIOS (or by the host OS).” That last one finally tipped me off to the BIOS setting. Stay away from Gigabyte motherboards if you are building a Linux based machine. Currently Ubuntu 17.04 fails at install with the error “unexpected irq trap at vector 07.” In the Canonical bug report there is a quote from Gigabyte which reads “Gigabyte do not guarantee Linux Platform on the desktop motherboard.” On the bright side the bug got me to try out Fedora 25 which I am loving so far. If you get the following while setting up a new React/Babel/Webpack project you forgot to install all of the presets. Occasionally when I’m out I’d like to be able to remote into my machine back at home. In the past I have opened up a random port, moved RDP to it, and called it good. I don’t really trust that level of security and I feel dirty when I get home. I’d like another layer there and I know OpenVPN is a proven technology. So I’m going to spend some time this weekend setting up OpenVPN on a CentOS machine that I have laying around. I’m hopeful that will allow me to VPN into my home network and then access my Windows machine over RDP. Let’s go! While my CentOS box is updating I’m surfing the web for some instructions. I use this machine as a build, test, and general development server. The following command tells me I’m running CentOS release 6.6 (Final). A quick yum search tells me that there is no ‘openvpn’ in the base repo’s so I’m going to enable EPEL. I’m pretty sure I had it setup once already, but I recently had to rebuild the server after a hard drive crash. Oh, that reminds me, I’m logged in as root because I haven’t setup extra accounts yet. I’ll need to fix that before vacation. I’m skimming sites for OpenVPN config info. This one mentions the EPEL and setting up keys with ‘easy-rsa’. What the heck, can’t I setup keys with some funky openssl command? I’ll keep digging… here’s ‘easy-rsa’ again and it looks like they’re building rpm’s by hand. No thanks. Ok, yum update finished so it’s time to install EPEL. Here’s the command I used to install this extra repo. I also follow it up by disabling it by default. Whenever I need it or want to run an update I tack on --enablerepo=. That keeps me from installing or updating something from the EPEL on accident. Don’t ask me where I got the command from, hopefully it still works. Oh, it’s already installed and ‘/etc/yum.repos.d/epel.repo’ says it’s disabled by default. Now yum reports that it found openvpn. Here goes nothing. The easy part is over and the fun begins. Now what? chkconfig --list tells me it is installed and not running yet. The post mentioned above tells me that there are sample config files and I see them. There’s nothing in ls /etc/openvpn so I guess that’s what I need to do. I’m going to copy server.conf over to /etc/openvpn, but wait what’s the init.d file say for config? I see nothing about a config file. Oh wait, never mind. It loops through the /etc/openvpn directory to find all .conf files. That seems a little sketchy but what do I know about init.d files? Guess I’ll copy it over and edit. I don’t know why I still type vim instead of vi. Steve at GRC tells me that some ISP’s block 1194 so I’m going to dump it on a random port. Why not, I was going to do it anyway. 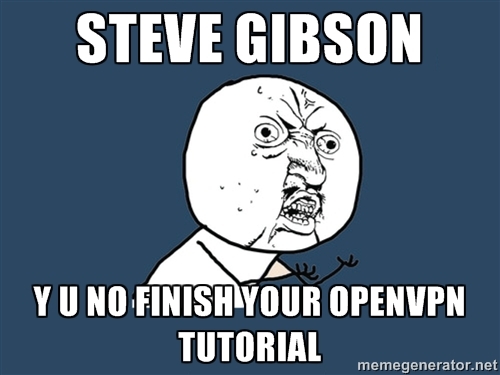 By the way Steve, why haven’t you finished your OpenVPN tutorial yet? Yes yes, I know proxpn sponsors Security Now. Research time. What’s dev tap/tun and dev-node? Why do all of these guides have one setup a private key first? That’s gotta be the easiest part of the whole thing. Ok, dev tun it is. Server fault tells me that mobile doesn’t support dev tap. Thanks Siegfried Löffler, I believe you even though you only have one internet point (that’s more points than me anyway). Oh fine, time to create a key. Looks like ‘easy-rsa’ is supplied by the openvpn people. Do I have to use it? Whatever, guess I’ll go for it. Oh, it’s not installed by default. Crud, where did it install? This says to make a directory and copy the files over. They’re in that spot so I’m going to believe what the magic internet tells me. Well look at that, that’s exactly what ‘vars’ tells me to do anyway. Change this, it’s obviously wrong. Still following for the key creation. Looks like they got it right to me. Why so many different extensions for (config, conf, cnf)? Wow, this config file is full of a bunch of stuff I don’t care about. Magic internet site tells me to run the following. Super user tells me that source “executes the content of the file passed as argument, in the current shell.” Thanks nagul, maybe I should have researched that before blindly running the command. Weird, how the heck does ./clean-all do anything? I don’t see it in the directory… oh, duh it’s a directory. Answer all of the nice scripts questions now please. You know what’s funny? I have done this exact process while creating a self signed cert for my server. Maybe I could do without easy-rsa? Oh well, this certainly is a lot less work. Ugh, this is taking forever. Finally, now I have a self signed cert that I don’t have to touch for 3650 days. I’m sure I’ll forget how I generated it in that time. Ignoring that copy the files like says. After this is all over I’ll need to remember to copy the client keys to my Mac. Back to the server config file, edit and change the lines. Everyone’s using Google’s DNS servers so I may as well also. I do like OpenDNS but I’m not going to argue with three other sites that I’m following. Am I done now? It seems like there should be more to the whole process. Guess I’ll punch a hole in my router and start the service. Maybe I can connect via my Mac internally. I’m assuming I know it works if I connect and get a 10.8.x.x address since I think I saw that in a config somewhere. Looks good, ‘ifconfig’ gives the same output as shown here. Now don’t I need to get some sort of key to my client? I would hope this is all secured with key files. Yep, I’ll need to copy the following to my Mac. To do that I’m going to archive them and then copy the archive over to my Mac. However you get the files to your machine is up to you. I always forget how scp works so the command is below but you’ll need to tune it for your setup. I’m using Viscosity on my Mac to do the client side. It’s $9, can handle multiple profiles, and I already have it installed. Nuts, looks like the Mac isn’t connecting. I know I can reach the server … oh poop, I choose the same port that SSH is running on. It couldn’t have even started. Interesting, checking the logs I see the following. I think I may need to correct that but I don’t really look forward to changing out my network configuration. Nov 1 18:58:09 dev openvpn: NOTE: your local LAN uses the extremely common subnet address 192.168.0.x or 192.168.1.x. 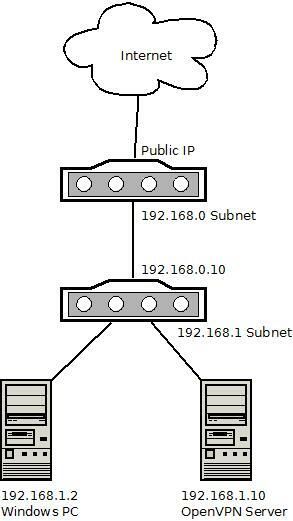 Be aware that this might create routing conflicts if you connect to the VPN server from public locations such as internet cafes that use the same subnet. I see little else in the logs and ‘service openvpn restart’ didn’t error while shutting down the service. Just in case I’m going to move the port and open a hole in the firewall. Oh, hah, SSH is using tcp over my port and openssh is setup to use udp. I think I just need to poke the udp hole in my firewall for that port. I’ll try that instead. MONEY! Yes! Now to poke a hole in my external firewall. I’ll port forward the same udp port to my server at 192.168.1.10. 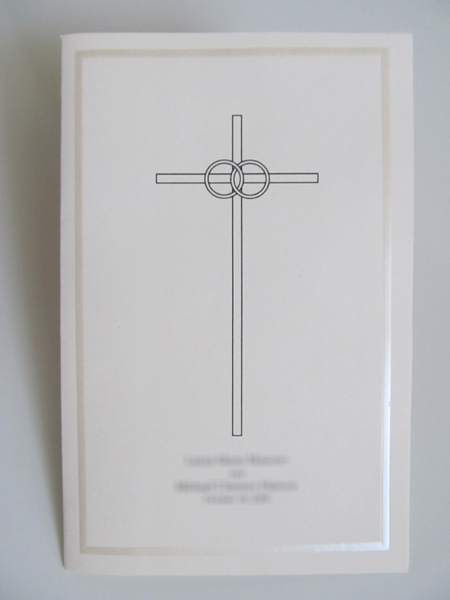 Now I’m not sure how to test this other than from some remote location. It all appears to be working correctly. I know I can reach my server and connect to it but I have no idea if my traffic can hop from my server to my workstation. I enabled Remote Desktop and poked a hole through Windows firewall for port 3389. I also added my user as a Remote Desktop User because I don’t run as admin. Oh, the internet tells me I can setup a subnet to test. That makes sense but I’m not sure that I can do that with my router. Maybe I can put my wireless router on a different subnet? Nope, not supported. I have a spare router around here somewhere. Oh, wait my cable modem has a router attached. I can jack into that and attempt to VPN into my second internal network. I’m running two because I don’t really trust this COX router. The subnet that my OpenVPN server lives on is 192.168.1.X and the subnet that my Mac and internal router are now on is 192.168.0.X. Traffic cannot flow from 192.168.0 to 192.168.1 without the VPN working. I’m excited, fire it up! HAHAHA, IT CONNECTED! Bad news, I cannot connect to my internal Windows box while connected to OpenVPN. I am connected though as I see tun0 with an IP of 10.8.0.6. Traffic is absolutely flowing but I think it’s stuck at the server. I also see ‘Nov 1 20:11:46 dev openvpn: 192.168.0.11’ in the logs which is the IP I’m connecting from. Time to research. Oh, neat. I ran iptables -F now my pings are coming through. Perhaps it was working and my firewall rules were just dropping ping packets. Nope, something is still blocking. I can now ping my Windows machine but RDP doesn’t seem to be working. I’m going to install Wireshark on my Windows machine to see if packets are coming in. What??? The packets are hitting the Windows machine. I can see them in Wireshark “Transmission Control Protocol, Src Port: 59778 (59778), Dst Port: 3389 (3389), Seq: 0, Len: 0”. Do I not have Windows Firewall setup correctly? Windows Firewall shows TCP/UDP 3389 is allowed in. I did change the port that RDP is listening to a little while ago. Maybe that service needs a reboot. That was it, after restarting all “Remote Destop *” services RDP is letting me in now. I would rather not run without firewall rules so I’ll do the opposite of ‘iptables -F’ now. Part of the trouble is my firewall rules are really agressive. Only certain ports are allowed in and out. I’ll drop all of the outbound rules because OpenVPN will be opening random connections when connecting to my LAN. Got it! Thanks to Bebop here I was able to get the correct settings for iptables. The major changes I made are below. There are a few cleanup tasks that I want to do next. First, I want some sort of password added to my key. Second, I need some sort of dynamic dns setup because my public IP will change eventually. Finally, I would love to have Google Authenticator setup to handle two factor auth. It’s getting late so I’m going to save those tasks for another day. When I started at Bates Group, LLC one of my first assignments was to debug an Excel VBA macro. Knowing nothing about the language I fought my way through the bug and fixed the macro. After that I quickly decided to learn more about the language. Since “Hello World” only gets me so far, I decided to do something a little tougher. What better way to do that than to think back to my college assignments? Back then one of the assignments I had was to write a random walk function. Imagine standing next to a lamppost on the street. From the lamppost you can take a step in one of four directions; North, South, East, or West. You take a step in a random direction and then look at where you are. From your new location you take another step in a random direction and you keep taking these random steps for a while. Finally you stop and look up, how far away from the lamppost are you? The following function does that only much faster than you or I could. It takes 20,000 steps total and colors them along the way. Every 2,000 steps it will change colors leaving a cool trail as it goes along.
' Where on the sheet should we start?
' How many steps per turn should we take?
' How many turns should we take?
' Should we step east or west?
' Should we step north or south? With that done I wanted to add another function to learn how to create a menu. I came up with the square flower. This function will generate a square of random size with each section of the square filled with a different color. This function taught me some tricks about looping in VBA, some ways are a lot faster than others. So what did I learn after all of this? Mostly that I have a strong dislike for VBA. It works well for small projects with small data sets. However those small projects quickly expand into real programs which need to be maintained. You are better off doing it right the first time instead of maintaining a large clunky macro. Download the complete macro here. You will need to enable macros in your security settings to get them to work. 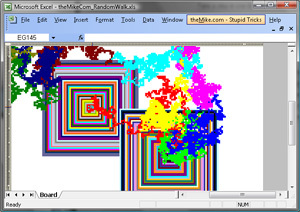 Once enabled, select “Random Walk” from the “theMike.com – Hello World VBA” menu. This will start a random walk which will finish after a couple of seconds. 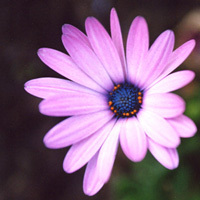 The “Square Flower” menu item will create a square flower under your cursor. iPods treat audiobooks differently than music files. For one you can leave an audiobook listen to something else, and later pick up where you left off. An iPod won’t do this when you are listening to music file. Furthermore an audiobook can have chapter markings making it easier to find a chapter in a longer book. iTunes makes it easy to create a music file for the iPod. You can insert a CD and iTunes will import it at the push of a button. Creating a proper audiobook however, is difficult with iTunes. You could import a whole CD as a single file but what if your audiobook covers multiple CDs? I’ve had this problem for a while now. My initial solution involved importing each track and numbering them in a way that they would line up in a playlist. This works, but it’s annoying. I can play the book but if I stop I have to remember which chapter I left off with. If I don’t go back to the book for a couple of days I forget where I am and have to start over. A couple of weeks ago I finally had enough and went searching for a better solution. The solution to my problem came from a program called Chapter and Verse by lodensoftware.com. The program will take a list of AAC (.m4a) files and convert them into one single audiobook (.m4b). This makes creating an audiobook from a CD very easy. 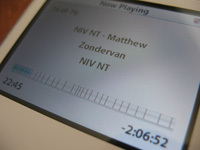 Simply import the CD using iTunes in the AAC format and then use Chapter and Verse to make the conversion. Chapter and Verse is not perfect however. If files are not in the AAC format it will have to convert them into this format before creating the audiobook. If you use a free audiobook solution such as librivox.org this means it’ll have to convert each file before combining them into one. Not too big of a deal, just plan a little extra time when creating an audiobook from a set of mp3s. Creating an audiobook is very easy in Chapter and Verse. First download and install the application. You will need to make sure iTunes is installed as well because it is used by Chapter and Verse to convert files. Once Chapter and Verse is installed start the application and it will load to an empty project screen. 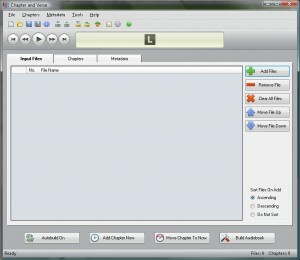 Each project contains a set of AAC audio files which will end up being the chapters in this simple tutorial. Begin by clicking the “Add Files” button to add the audio files you want to be a part of the audiobook. The open file dialog only shows MP4 files by default so be sure to change the filter if you are adding say .mp3 files. If you added a file that is not in the AAC format Chapter and Verse will attempt to convert the file using iTunes. In that case click “Yes – Convert” on the conversion screen. iTunes will open for the conversion, do not close it until it’s done. When Chapter and Verse is done with the conversion your files will be added to the “Input Files” tab. Click on the “Chapters” tab to change each chapter’s name. On this tab you can rename each chapter in the audiobook. For my audiobooks I generally set each chapter name to be the same as that of the file. There are several options here that you may wish to explore. Near the bottom of the tab there is an “Input Files” dropdown where you can choose prefixes for the chapter names. I usually to choose the <Filename> option and leave the rest of the settings at their defaults. The “Metadata” tab allows you to change the file information for the audiobook. I usually set the title because that is displayed in the track listing on the device. Finally make sure “Autobuild” is on and then click the “Build Audiobook” button. Chapter and Verse will ask you where to save the file and then will create the book. Click Add Files to add your audio tracks, Chapter and Verse will convert them if necessary. Edit the chapter titles on the “Chapters” tab. Edit the final file information on the “Metadata” tab. Ahh programming for a living… There’s nothing quite like working on someone else’s problem for hours on end trying to get the dumb thing to do what you want. But since my fun projects don’t put food on the table I have to snap out of it and get my head back into what actually does. I find on those days it’s best to medicate the problem a little with my trusty iPod. With my iPod I can do something for myself while still working and lately I have been on an audiobook and podcast kick. iPods treat audiobooks and podcasts differently than they do music files. For one you can leave a podcast, listen to something else, and later pick up where you left off. An iPod won’t do this when you are listening to music. Furthermore an audiobook can have chapter markings making it easier to find a chapter in a longer book. iTunes makes it easy to create a music file for the iPod. You can insert a CD and iTunes will import it at the push of a button. Creating a proper audiobook however, is impossible with iTunes. Oh sure you could import a whole CD as a single file but what if your audiobook covers multiple CDs?